Washington Navel Orange-- Tree medium, drooping, round. Fruit medium to large, thick-skinned, juicy. 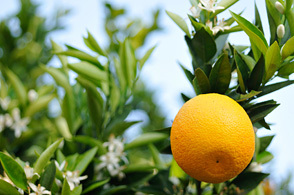 Considered the world's finest orange for eating, navels are seedless, and they peel and segment easily. Harvest December to March.